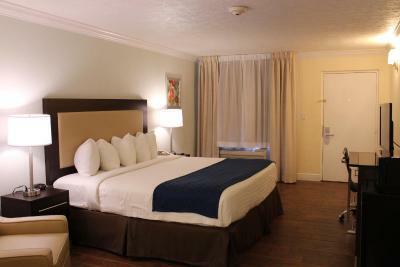 Lock in a great price for Fairway Inn Florida City Homestead Everglades – rated 8.4 by recent guests! The price was right for us to stay at this updated motel as we passed through the area. It was nice that a basic breakfast was included. This was a return trip from Key West and our second stay at this motel. This is a large 2 story complex located in several units but was surprising quiet. Breakfast was the standard breakfast buffet. The exterior grounds were nice, and there was an outdoor pool which we didn't use. There is also a visitors center on the property which is helpful when traveling. Close to restaurants and gas stations and a Dunkin Donuts in the gas station right next to the property. Nice room. Big comfy king size bed. Room was clean and comfortable. The property is very pleasing to the eye. Pool looks nice but didn’t have a chance to go in. Staff is really friendly and super helpful. The room was clean and comfortable, the grounds were just beautifully landscaped, ck in was quick & efficient and breakfast was very nice. The breakfast room was large with plenty of tables. We had waffles, coffee and orange juice, tiny muffins (slightly stale), and eggs (not great). It was OK and filling. 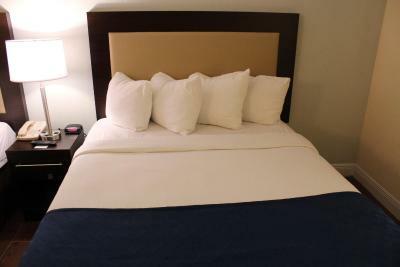 The room was of adequate size for 2 people with a comfortable king size bed. 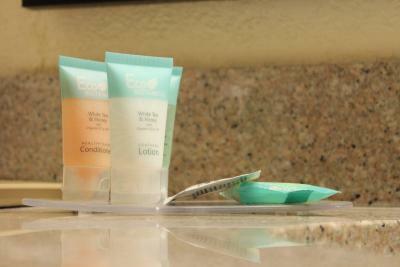 We liked the large countertops around the sink to put our toiletries. We only stayed one night, but the location was very convenient for our drive down to Key West the next day. The grounds were amazing. The location was awesome for us to leave the next morning for the keys. The rooms were clean and pretty spacious. The pool area and picnic areas were always kept clean. The breakfast was pretty good. The location was perfect for visiting various sites in the surrounding area. 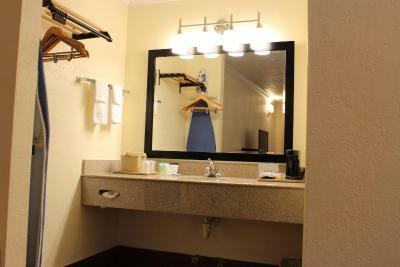 Fairway Inn Florida City Homestead Everglades This rating is a reflection of how the property compares to the industry standard when it comes to price, facilities and services available. It's based on a self-evaluation by the property. Use this rating to help choose your stay! Featuring an outdoor pool with a waterfall, this Florida City motel is a 5-minute walk from Florida Keys Factory Shops. 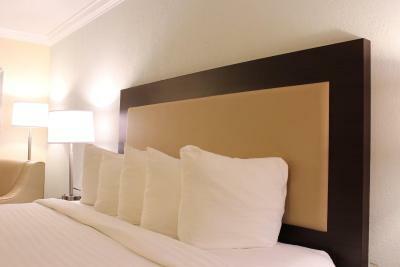 Guests can enjoy a daily continental breakfast, complimentary tea and coffee in the lobby, and free Wi-Fi. 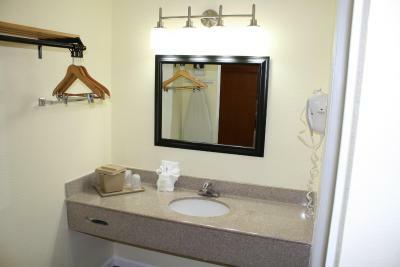 Cable TV, small refrigerator, and microwave are included in all rooms at this Florida City Fairway Inn. Select rooms have a pool view and a hardwood floor. 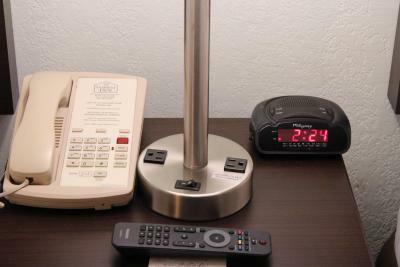 A 24-hour front desk and a business center are available at Fairway Inn for added convenience. Surrounding activities include diving, snorkeling, and fishing. A laundromat, free parking, and vending machine are available as well. The Everglades National Park and Biscayne National Park are less than 9 miles away. 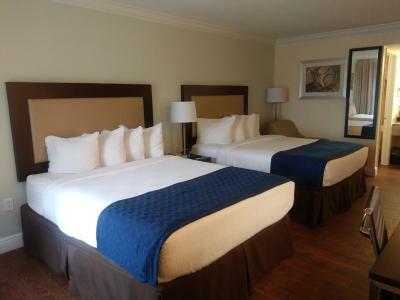 The motel is also 5.5 miles from Everglades Alligator Farm. Homestead-Miami Speedway is 4 miles away. This property also has one of the top-rated locations in Florida City! Guests are happier about it compared to other properties in the area. This property is also rated for the best value in Florida City! Guests are getting more for their money when compared to other properties in this city. 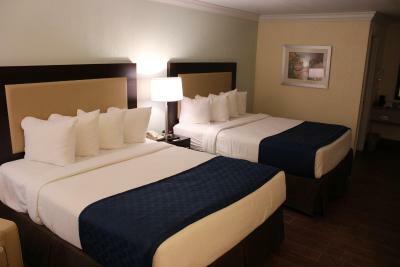 When would you like to stay at Fairway Inn Florida City Homestead Everglades? 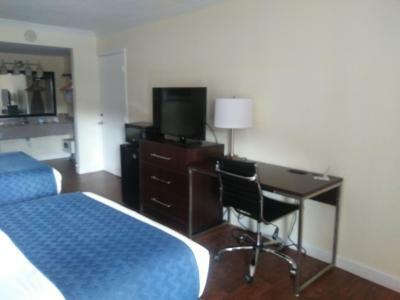 This room includes a microwave, a small refrigerator, and cable TV. This room has a microwave, small refrigerator, and cable TV. 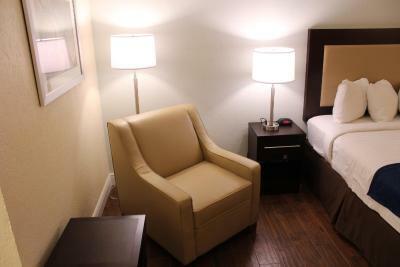 This room features a flat-screen TV, leather chair, work desk, coffeemaker, microwave, and a small refrigerator. 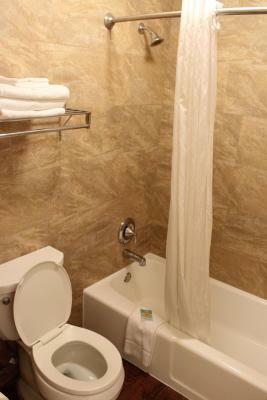 Our highly rated, Certificate of Excellence winning, and AAA approved hotel is privately owned and family run. 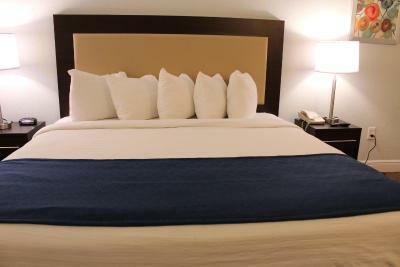 We offer clean rooms, friendly staff, convenient location, fantastic amenities and the best available rates in town. 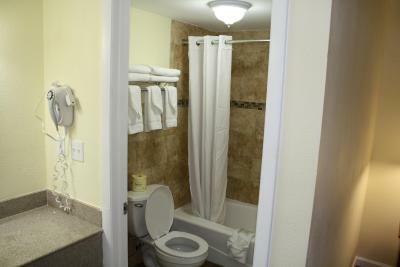 House Rules Fairway Inn Florida City Homestead Everglades takes special requests – add in the next step! Fairway Inn Florida City Homestead Everglades accepts these cards and reserves the right to temporarily hold an amount prior to arrival. Please note that on-site parking is only available for registered guests. Clean rooms. Great pool. Included breakfast. Finally no carpets in the room! The air conditioning was a wall unit. It was loud & we found it to not keep the temperature very consistent. Very good hotel. 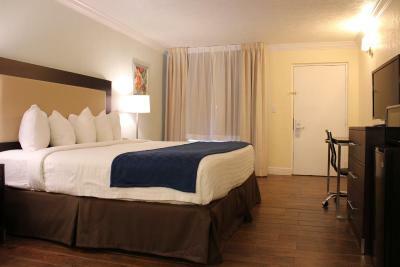 Excellent breakfast, very clean rooms, excellent location to visit the Everglades and Keys. Many restaurants and supermarkets in the neighebourhood. The beds are very loud and creak and snap when moving which is very disruptive to sleep. The beds seem to be on some type of metal platform but it baffles me as to why they are so noisy. I have never stayed in a motel/hotel where this has happened. My friend walked in this floor barefoot and it was very dirty. There were also small moths in the room flying around. Breakfast room ridiculously small. Air conditioning as noisy as a truck in your backyard. Need to run it full blast before going to bed, than switch it off if you intend to sleep. It can only be adjusted between noisy and extremely noisy. Safe box to keep valuables was broken. They tried to repair it but without success. Room locks old fashioned. Can be opened in a few seconds by anyone interested in seeing what you have inside. Position ok to start a daily excursion to the Keys Islands. Fair price. Standard Motel for US. Breakfast acceptable but choice limited. I stayed overnight at this hotel while travelling from Miami to Florida Keys. The room was clean although simple and it's nice that it has a swimming pool. The surrounding area has many shops, restaurants, etc which is very convenient. If I was ever in the area again, I would definitely consider staying there again.